Smart Navigation Breadcrumbs is powerful and easy to use plugin that can add breadcrumbs navigation to your website. Breadcrumbs are fully customizable and responsive. Plugin support custom post types, custom taxonomies, all types of archives, attached media files, 404 page, search results, bbPress plugin forums and more. You can control display for different types of breadcrumbs items, hierarchy and taxonomies for different types of WordPress objects. Plugin uses Smart Responsive Breadcrumbs plugin for jQuery/CSS also developed by SMARTPlugins. So, you get all styling and features from this plugin. Plugin allows use of any colors combinations, with different effects to style the breadcrumbs. Plugin also supports RDF specification for rich snippets markup used by Google and other search engines to identify breadcrumbs and use them in the search results. Plugin can generate breadcrumbs for all kinds of WordPress pages (archives, single, search, 404…) with support for bbPress plugin forums and topics. Breadcrumbs for date, author, post types and taxonomy terms archive. Breadcrumbs for home, search results and 404 pages. Breadcrumbs for default and custom post types single posts. Support for bbPress Forums plugin for forums, topics, replies. Support for BuddyPress plugin for members, activity and groups. Support for WooCommerce, JigoShop and other plugins. For smaller screens, plugin turns from horizontal to vertical menu. For touch based devices, replaces hover with click for easier control on such devices. 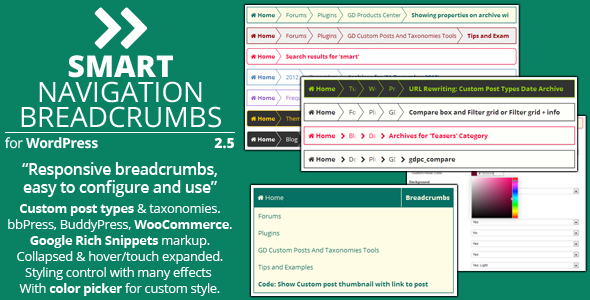 Control display of breadcrumbs elements (support for HTML, font icons…), use of taxonomies for post types, hierarchy display and breadcrumbs visibility. Change colors, add shadows, borders, compact display, breadcrumbs element, expand and collapse animation. All with the admins side preview of saved style settings. Plugin can format embedded breadcrumbs to use Google supported Rich Snippets format, allowing search engines to detect breadcrumbs and use them in search results. Notice on the image above detected breadcrumbs in green from Google search results. bbPress. Tested with bbPress 2.5. BuddyPress. Tested with BuddyPress 2.6 and 2.7. WooCommerce. Tested with WooCommerce 2.6. Breadcrumbs are fully responsive with mobile/touch devices support. Change the way breadcrumbs look with colors and effects style settings. Control crumbs divider element and collapsed breadcrumbs state. Control over animation for both breadcrumbs states. Generates unique CSS classes for every breadcrumb element. Filter for developers to expand and replace generated breadcrumbs. Support for WPML plugin and translations based on updated text. Options to reset plugin settings for both settings and styling. Direct theme integration support: Theme Hybrid. Direct theme integration support: Genesis Framework based themes. Supports WordPress Multisite installations for individual sites. Supports translation and includes POT file. Due to nature of WordPress themes, in most cases you need to manually integrate plugin into the theme. Plugin contains PDF user guide in the plugin package, inside the ‘documents’ directory. Check out this document to get information on plugin options, usage and more. Powerful premium plugins for WordPress and jQuery. Includes plugins for security, cleanup, Envato Market integration, timers and popups in jQuery and more. Each plugin includes extensive documentation that comes as one or more PDF files in the download package for each plugin downloaded from Envato CodeCanyon. Get started with the knowldge base and ever growing list of quick help frequently asked questions, articles, tutorials and videos for all the plugins. If you need more help with any of our plugins, additional information about plugin features or if you need to report bugs, visit our support forums.